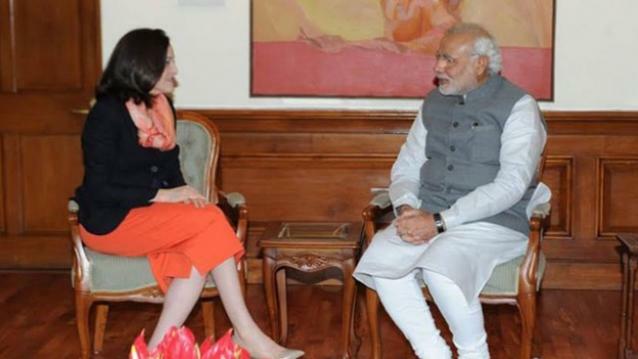 Indian Prime Minister Narendra Modi has met Facebook COO Sheryl Sandberg to have discussion on how to leverage digital media to promote direct communication between people and the government and how India could use the platform for spreading awareness among people. Sheryl Sandberg is presently in India. “It was a privilege for me and my Facebook colleagues Marne Levine to meet with Prime Minister Narendra Modi today…Meeting him gave me the opportunity to express my personal appreciation to him for making the education of girls and women a priority as equal opportunity is essential for strengthening all economies and creating a just world”, Sandberg said in a statement after the meeting. On this Narendra Modi, who is the second most popular politician in the world by Facebook’s own estimation, said “Being an avid user of social media myself, I talked about ways through which a platform such as Facebook can be used for governance and better interaction between the people and governments. I also talked about how Facebook can be used to bring more tourists to India,” he said in his post. “We intend to commemorate Mahatma Gandhi’s 150th birth anniversary year with a special focus on cleanliness and I spoke to Ms. Sandberg on how Facebook can assist us in this endeavour,” he added. A few days back, Sandberg had said that India possesses the potential to become the largest market for Facebook, but the challenge is to bring another one billion users to connect with Facebook. The meet however seems like a step towards making it happen. Anyway, India with the highest growth potential is only second to the US in term of active Facbeook users.